-- Select a Size/Color -- Pink Blue Red - Out of Stock! Dazzle your dog or cat's collar with the stunning Kitty D-Ring Collar Charm by foufou Dog. 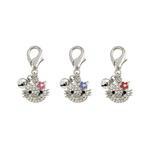 This beautiful collar charm for cats is made with Czech Crystals and is entirely lead free and rodium plated! The lobster clasp fits most D-Rings. Gift Boxes are available in three colors: pink, blue, and red. Kitty D-Ring Collar Charm Customer Photos - Send us your photo! Posted On 04/24/15 by Betty L from , Yes, Betty L recommends this product! every order I've ever purchased from BaxterBoo has met my expectations! they have great variety and quality products. They have great sales and free shipping...great site!